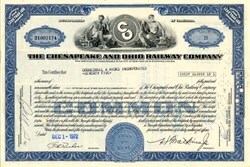 Beautifully engraved certificate from the Chesapeake and Ohio Railway Company issued no later than 1972. This historic document was printed by the American Banknote Company and has an ornate border around it with a vignette vignette of two allegorical men sitting flanking the famous C and O Logo. This item has the printed signatures of the company's president and secretary and is over 37 years old. On February 18th 1836 the farmers of Louisa County, Virginia, incorporated the Louisa Railroad to help get their products to market. Starting from Hanover Junction, now Doswell, in December of 1837, the first segment was laid to Fredericks Hall. The directors of the railroad contracted with the Richmond, Fredericksburg & Potomac to operate the line as a branch, but broke with the RF&P in 1847 to expand towards Richmond and towards the west. The name of the railroad was changed to the Virginia Central in 1850. After a legal battle with the RF&P over access to Richmond, the Virginia Central reached the city in 1851. During that time the railroad had completed its westward line past Charlottesville ending at Mechum's River. In 1850 the commonwealth of Virginia, which held 40% of Virginia Central stock, began construction of the Blue Ridge Railroad from Mechum's River and reached Waynesboro in 1854 by way of the longest tunnel ever constructed. During the construction a temporary line over the mountain and special mountain climbing engines were used until the tunnel was completed in 1858. By 1857 the Blue Ridge Railroad reached Clifton Forge and came under lease to the Virginia Central. During the 1850's the railroad's biggest competitor was the canal being constructed by the James River Company started in 1785 with George Washington its president. By 1851 the canal had reached its farthest navigable point on the James River and a railroad was proposed to span the distance to the Ohio River. Construction on the Virgina Central was postponed until the fate of the Covington & Ohio was determined. The answer came in the form of the Civil War, halting construction on both lines. The Virginia Central was used extensively by the South and suffered for it. Service was restored after the war by July 23rd, 1865. While the majority of the Covington & Ohio line now was within the new state of West Virginia, and out of the hands of the commonwealth of Virginia, construction continued on the Virginia Central to connect with it at Covington in 1867. The two railroads then merged into the Chesapeake & Ohio Railroad, chartered in both Virginia and West Virginia, in 1868. The success of the C&O was assured when Collis P. Huntington became president of the line on July 15th 1869. Construction west continued with more tunnels and massive fills. At the same time construction east was begun from the new city of Huntington on the Ohio River. The two lines were connected at Hawks Nest, West Virginia on January 28th 1873. But the promise of revenue was halted by the depression of 1873 and a steel industry that never came to Virginia. The railroad went into receivership in 1875 and came out as the Chesapeake & Ohio Railway in 1878. In 1881 the C&O connected its line to the Elizabethtown, Lexington & Big Sandy Railroad, which gave it access to Cincinatti by way of Lexington, Kentucky, over the Kentucky Central. Both lines were controlled by Huntington as were the profitable packet boats that ran from Huntington to Cincinnati. A direct line to Cincinnati was not completed until 1888. The C&O was extended east to the port at Newport News in 1882 and coal export became the staple of the C&O to this day. Collis P. Huntington by 1888 had control of several railroads linking coast to coast, but lost control of the C&O to the Vanderbilts in receivership in 1889. Under the Vanderbilts many improvements were made to track, tunnels, and bridges. New trackage was acquired in Virginia providing a second route from Clifton Forge to Richmond, and trackage rights on the Virginia Midland, later Southern, were obtained to reach Washington D.C. in 1889. Passenger service reached New York by way of the Pennsylvania Railroad. Before the days of antitrust sentiment, the C&O was under the control of the New York Central and the Pennsylvania until 1908. The C&O extended its lines within West Virgina to reach the coal fields and extract lumber. In 1910 the C&O purchased the Chicago, Cincinnati & Louisville Railroad in foreclosure. The C&O also had control of the Kanawha & Michigan and the Hocking Valley Railway giving it access to the Great Lakes at Toledo. In 1923 the railroad came under control of the Van Sweringen brothers and through arrangements was aligned with many railroads in the region, but a merger of the Nickel Plate, Erie, C&O and others never ocurred. The C&O did merge with the Hocking Valley in 1930. The C&O was still profitable even through the Great Depression and made many track and tunnel improvements. In 1947 the C&O merged with the Pere Marquette. Under the leadership of Robert R. Young, the C&O modernized its passenger fleet but could not stop the decline in passenger traffic. Young sought to merge with the NYC, but instead gave up his C&O position in a proxy fight to become chairman of the New York Central in 1954. Instead of merging with the NYC the C&O gained control of the B&O, which was having financial problems, and thus control over the Western Maryland in 1963. The combined railroad increased diversity and broadened its market. In 1972 Hays Watkins integrated the combined lines into the Chessie System with a modern paint scheme and Ches-C cat logo. In 1980 the Chessie System merged with the Seaboard System, creating the CSX Corporation, giving it access to the entire eastern United States. With the merger into CSX Transportation, the Chesapeake & Ohio and many other lines ended their great history.